Well we are back up in the Upper part of the Lower Peninsula of Michigan again and that means more spotty internet and even more painting of our lake house. Even better is that I decided to do a random search on Craigslist before we left and someone only 10 minutes from our lake house is selling their dock and we were in the market for a new one. So that means today is dock retrieval, removal of the old one and installation of the new one. It is going to be a long day and I am anticipating some serious hiccups, because that’s how projects seem to go. Yesterday we painted our large entry room. When we moved into this house 3 summers ago everything was covered in shag carpet and dark wood paneling. We have since redone all of the floors and painted every room except for the entry. So we spent the whole day painting and redecorating. I swear, you never stop painting a house. I already have other ideas running through my head (and I hope my husband doesn’t read this today). We live in a very hilly area with curvy roads. This makes for some rough running and since yesterday was speed training day we headed into town. I grew up in a very small town in Michigan and when I was younger all I dreamed about was moving away to a city. When I was 14 I moved to Indianapolis to train for figure skating and in college I took off to New York City. Now we split our time between Chicago and New York so I see plenty of city life. As I have gotten older though I have a much better appreciation for the way I grew up. I got to climb trees in the woods and ride my bike everywhere without a single worry. I knew everyone in my graduating class and when I go to the grocery store I almost always run into someone I know. I took the opportunity yesterday to run around town. 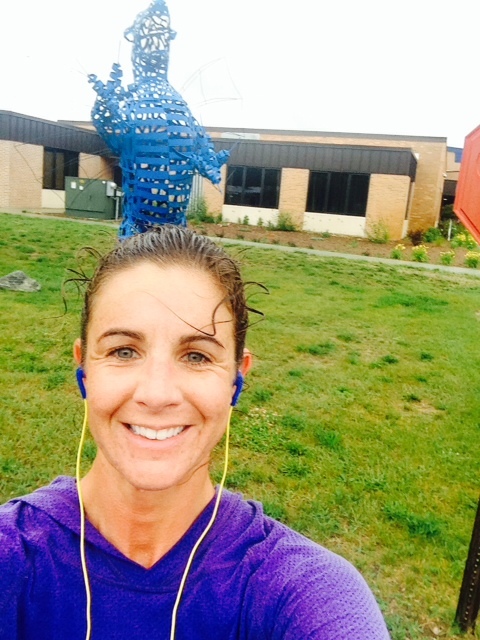 It felt like a flood of memories and not just because it was pouring during the entire run. I started out at the local ice rink where I taught skating when I first moved back home. Then I ran past the small house we lived in until I was four. It was here that I stopped in front of my high school and took a picture with our mascot, The Blazer. 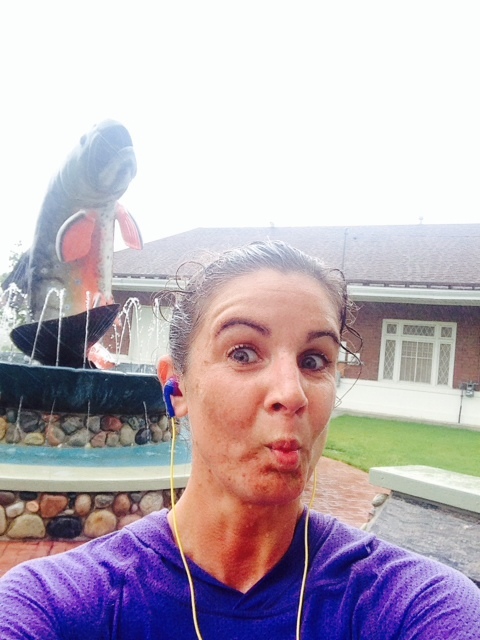 I ran past the nursing home where my grandmother spent the last few years of her life. She passed away this spring and it brought back a lot of memories of lunches with her and my mom in the dining hall. I ran down a desolate road where I did my first 2 mile run with the freshman track team. I remember hating it back then and my season was short lived. This time I ran that road twice and felt fantastic. After I completed one loop I still had another 3 miles that I wanted to get in so I ran back into “downtown” to the main road. I stopped in front of the trout and did a selfie. Our town is home to the National Trout Festival every spring on the opening weekend of trout fishing season. Despite the fact that very few people really know where I grew up, when I mention that it is the town with the big trout that you drive past, they know exactly what I am talking about. This also happens to be where the starting line was for my very first 5k. I think I was 9 years old. The run has been done as a memorial for a boy who grew up down the street from us and later for his father as well. They were both outstanding runners. I ended up back at the local rink and for about the 10th time in the last week in various rinks I changed clothes there. It made me realize that there is a very good chance that I will never get to a point in my life where changing clothes in the rink bathroom isn’t some sort of normal routine for me. Given my run down memory lane, it was just about the perfect ending. Love running in my home town, you really get to see it in a different light! I love running when I go back home. It is so weird now that we sold our house, that I won’t be able to do my standard routes. But it really is the best, isn’t it? It really is the best. It was funny to watch my mind wander from place to place and all of the memories that started coming back. I love running here at home, I know my routes from 1 mile to 15.5 miles . Oh thank you. You are so sweet. It is nice to be able to reflect during runs. Trust me, as you continue it will become a normal part of your running routine. And don’t worry, there will be lots of pics to come. This kind of makes me wish that I had a home to go to and run, but I’m already here. 🙂 Such a beautiful post! Already being home isn’t so bad. Thanks for the sweet words. Oh how cool is that! We are just outside of Traverse City. I ran the Charlevoix Marathon last year and it was amazing! In that first pic, it looks like you’re wearing a funny hat. Memories of your grandparents are so precious, aren’t they? Nice, love the selfies! I wish I could go home to Ohio and go for some runs. I need to make that wish a reality.